Ion exchangers are materials that can exchange one ion for another, hold it temporarily, and then release it to a regenerant solution. In a typical demineralizer, this is accomplished in the following manner: The influent water is passed through a hydrogen cation-exchange resin which converts the influent salt (e.g., sodium sulfate) to the corresponding acid (e.g., sulfuric acid) by exchanging an equivalent number of hydrogen (H +) ions for the metallic cations (Ca+2, Mg+2, Na+). These acids are then removed by passing the effluent through an alkali regenerated anion-exchange resin which replaces the anions in solution (CI", S04", N03") with an equivalent number of hydroxide ions. The hydrogen ions and hydroxide ions neutralize each other to form an equivalent amount of pure water. During regeneration, the reverse reaction takes place. 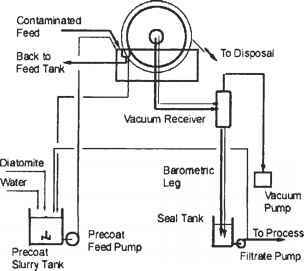 The cation resin is regenerated with either sulfuric or hydrochloric acid and the anion resin is regenerated with sodium hydroxide. Figure 1 illustrates a basic scheme for ion exchange demineralization. that we have, in effect, a number of multiple demineralizers in series. Higher-quality water is obtained from a mixed-bed unit than from a two-bed system, (see Figure 2 for an example). 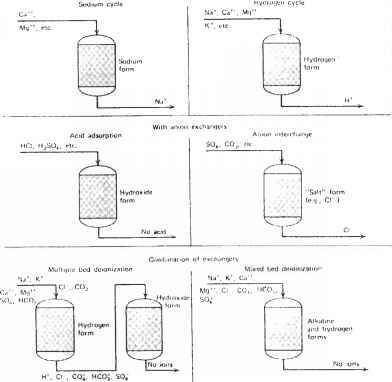 Operation of cation and anion exchanges is shown in Figure 3 (for fundamental processes) and Figure 4 (operation modes for both cation/anion exchanges). M+= Cu++, Mx Wv", Nn+.K*. etc. x"=sa4", a-.Nos-, etc. Effluent dejonueil b. Cation end onion exchanger*! Figure 3. Operational schemes of ion exchange. To be suitable for industrial use, an ion-exchange resin must exhibit durable physical and chemical characteristics which are summarized by the following properties. Functional Groups - The molecular structure of the resin is such that it must contain a macroreticular tissue with acid or basic radicals. These radicals are the basis of classifying ion exchangers into two general groups: (1) Cation exchangers, in which the molecule contains acid radicals of the HS03 or HCO type able to fix mineral or organic cations and exchange with the hydrogen ion H (2) Anion exchangers, containing basic radicals (for example, amine functions of the type NH2) able to fix mineral or organic anions and exchange them with the hydroxyl ion OH" coordinate to their dative bonds. The presence of these radicals enable a cation exchanger to be assimilated to an acid of form H-R and an anion exchanger to be a base of form OH-R when regenerated. Figure 4. 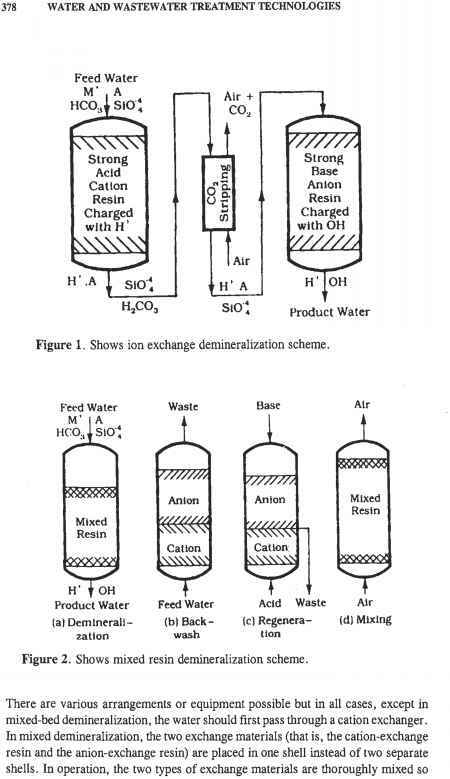 Various ion exchange schemes. These radicals act as immobile ion-exchange sites to which are attached the mobile cations or anions. For example, a typical sulfonic acid cation exchanger has immobile ion-exchange sites consisting of the anionic radicals SO to which are attached the mobile cations, such as H+ or Na+. An anion exchanger similarly has immobile cationic sites to which are attached mobile (exchangeable) hydroxide anions OR The radicals attached to the molecular nucleus further determine the nature of the acid or base, whether it will be weak or strong. Exchangers are divided into four specific classifications depending on the kind of radical, or functional group, attached; strong acid, strong base, weak acid, or weak base. Each of these four types of ion exchangers is described in detail below. Solubility - The ion-exchange substance must be insoluble under normal conditions of use. Most ion-exchange resins in current use are high molecular weight polyacids or polybases which are virtually insoluble in most aqueous and nonaqueous media. This is no longer true of some resins once a certain temperature has been reached. For example, some anion-exchange resins are limited to a maximum temperature of 105° F. Liquid ion-exchange resins exist also, yet we do not consider their applicability here and they also exhibit very limited solubility in aqueous solutions. Bead Size - The resins must be in the form of spherical granules of maximum homogeneity and dimensions so that they do not pack too much, the void volume among their interstices is constant for a given type, and the liquid head loss in percolation remains acceptable. Most ion-exchange resins occur as small beads or granules usually between 16 and 50 mesh in size. Resistance to Fracture - The ion or ionized complexes that the resins are required to fix are of varied dimensions and weights. The swelling and contraction of the resin bead that this causes must obviously not cause the grains to burst. Another important factor is the bead resistance to osmotic shock which will inevitably occur across its boundary surface, as there will be a salinity gradient of different magnitude during the cycle of the exchange material. The design of ion-exchange apparatus also must take into consideration the safe operation of the ion-exchange resin and avoid excessive stresses or mechanical abrasion in the bed, which could lead to breakage of the beads.